How much does it cost to hire a CPA? This is a big question for a small business. It’s easy for costs to get out of control - and that’s exactly what you’re trying to avoid by hiring a CPA in the first place. 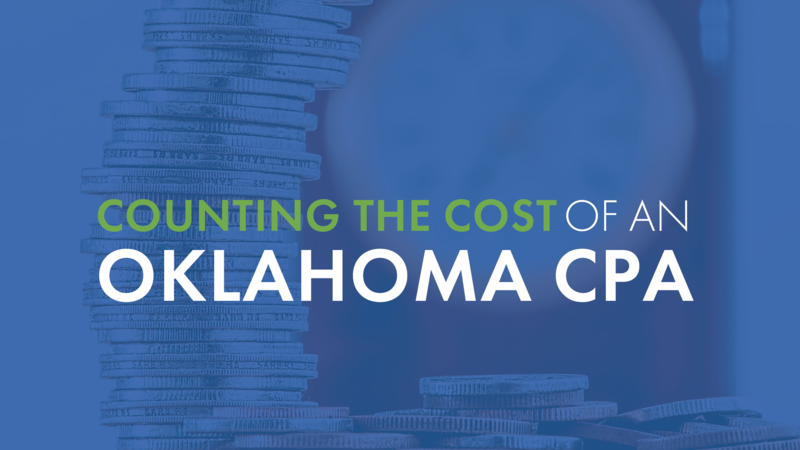 Let’s look at the cost of hiring an Oklahoma CPA and what it means for your business. Asking what it costs to hire a CPA is a bit like asking what it costs to buy a car. It depends on your needs and what you’re willing to invest. You can stick with the basics, or seek out all the bells and whistles. The most essential tasks a CPA performs are bookkeeping, tax preparation, and ensuring you stay compliant with the law. Beyond that, you can look for someone with skills that go much further: financial consulting, forecasting, banking, financing, and small business coaching. A simple one-time fee for tax preparation might be around $400 for a small business, depending complexity of your business. For a large firm with a big demand for ongoing CPA services, the annual billing could easily total $100,000. If you hire an employee to do your accounting, you’ll need to pay them somewhere between $40,000 and $120,000 a year, according to the Bureau of Labor Statistics. CPAs with ample experience require pay at the high end of that scale, because they are in high demand. That figure doesn’t include benefits like health insurance and paid time off. Because these costs can add up to a huge total, many companies explore using an outside service for accounting. You get the same benefits of using a CPA, minus the expense of hiring an employee. Some CPAs charge an up-front fee, or retainer, plus an hourly rate. Some also charge special rates for certain like tax preparation. As you search for a CPA, ask for clarity on their payment structure. It’s also a good idea to inquire about their ability to provide more in-depth services, and what the fee for that would be. If you’re planning to expand your business or spin off a new division, for example, you might need extra advice and support. The CPA might even view it as a separate business and need to charge a separate set of fees. All of these things are essential to know in advance. Here’s another important consideration to keep in mind: Hourly rates are a big risk. You’re not an accountant - that’s why you’re hiring one - and it will be hard for you to know exactly what you’re being charged for. When you’re not a CPA, it’s hard to know what a reasonable timeframe would be for tax preparation, for example. Should it take 5 hours? 20 hours? 50 hours? Your CPA may even have a hard time estimating in advance, because they could encounter unexpected challenges that slow things down. Consider hiring a CPA that charges a flat monthly fee. With this approach, you’ll know exactly what your monthly payment will be, and the cost will never get out of control. The CPA will present you with a menu of services and you’ll know exactly what will appear on your bill. Ascension CPAs & Consultants is a full-service firm that offers CPA services, plus consulting and financial support. We charge on a 100% flat monthly basis, providing total clarity in billing. Our fixed, flat fees start at only $500 a month. We can reduce the tax burden you face and provide business consulting with a personal touch. Call 405-759-2796 or use our contact form for a free consultation.